Join Leonard and invest in high-quality early childhood education! Ruth Pack-Adler is a current donor and mom of a Center alumnae. She is also a passionate advocate for all Center families because she experienced firsthand the impact that The Childhood League Center can make. As you read Hannah’s story, please join her and give today. It was in the fall of 2001 when our daughter, Hannah, first came to The Center. Our silent, sensitive, curly haired little girl was just learning to walk, nonverbal, and struggling with any type of noise, touch or change to her schedule. From the very first day, it was clear to me that our time at The Childhood League Center was not just for Hannah and her development. It was also for me to learn how to become her advocate and for us as a family to learn what it meant to have a child with “special needs”. 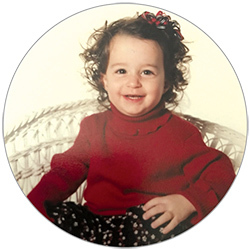 That first year, Hannah worked intensively in speech therapy, and before long, the words started to come. In a matter of weeks, those words became sentences. Through physical therapy Hannah’s wobbly gait became stronger and steadier while occupational therapy focused on sensory integration. She was doing well and we began preparing to transition Hannah to a typical preschool. Yet that following spring, evaluations showed that Hannah’s struggles were not over and, in fact, she needed more intensive OT and PT. I was so focused on her speech issues that I failed to see how significant the other challenges were. Finally at age four, we received the diagnosis of ataxic cerebral palsy. By then, it was just a label for us, but it provided some closure to years of searching and doctors’ appointments. Watch a young Hannah talk about school! Through regular giving, you allow us to plan for the future and develop even more ways to help children reach their absolute fullest potential. For this reason, your continued support is the greatest gift you can give. Thank you for your support! We all continued to do the work we had to do. We never told her she couldn’t do anything but let her pave her own way. Hannah gave it her all, and she was happy and growing, doing well in school and making friends. 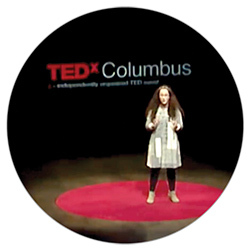 Fast forward to now, miles away from the hospital NICU and endless doctors’ appointments, Hannah was nominated to speak at TEDx Columbus last fall. In front of nearly 800 people, she spoke about her disability and how it affects her life. She was composed, self-assured and touched many people with her story. 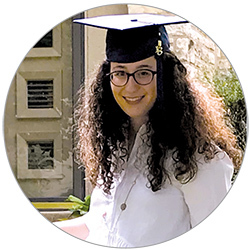 Then a few weeks ago, Hannah walked across the stage at Columbus Torah Academy and received her high school diploma – a diploma that represents so much more than successfully taking all of the required coursework. It represents a whole lot of hard work that resulted in excellent grades while struggling to sit in a classroom when the lights and the sounds and the other people were overwhelming. 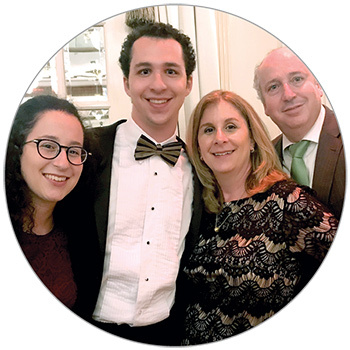 Now, before starting at Stern College in New York City, Hannah is in Israel for a “gap year” that is sure to be both challenging and amazing. But Hannah has never walked away from trying something. And it proves that it never really mattered that she didn’t hold her pencil the way the other kids did. It’s like I blinked my eyes and time sped by. We are forever indebted to The Childhood League Center and its many amazing teachers, therapists and staff. They set that little curly haired toddler on a path that knows no bounds. Your gift immediately begins to help a child get started on a path that will forever change the trajectory of their life. Please click here to give today. Donors are invited to join the Pathfinders Society. Established in 2011, the Pathfinders Society recognizes donors who, through their generous annual contributions of $1,000 or more, share our vision of serving our community’s children with special needs.